he lighthouse is, in many ways, a romantic reminder of the beauty of the high seas. People have long been mesmerized by the immense power and responsibility of this solitary building in directing watery traffic. In turn, ship captains and crews placed their trust in the keeper’s hand to shine a beacon of light to keep the mighty vessels safe. Its influence goes much further, however. The American lighthouse, in particular, serves as an important window into the history of this great nation. Lighthouses have existed for close to two thousand years. 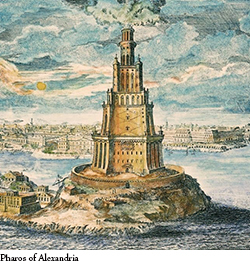 The first widely accepted example was the Pharos of Alexandria, one of the Seven Wonders of the Ancient World “which guarded the entrance to the Greek City.” (It was almost completely destroyed in the 14th century, although remnants were discovered in 1994 in Alexandria’s Eastern Harbour.) An ancient Roman lighthouse, the Tower of Hercules, still stands in Spain. There are, and were, many fine English examples, including the Eddystone Lighthouse - which has been rebuilt on four occasions. Yet, the introduction of lighthouses in colonial America was a remarkably slow process. 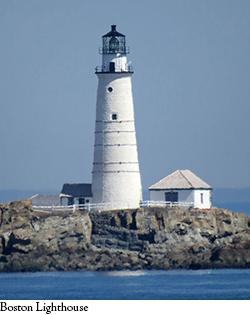 In 1701, Samuel Clough posed this question in The New England Almanack’s second edition: would a lighthouse at Point Allerton in the Boston Harbour “not be of great benefit to maritimers coming on these coasts?” After some local merchants petitioned the Massachusetts legislature in 1713, a committee was appointed to explore this issue. They ultimately chose Little Brewster, which was “about one mile north of Point Allerton, on the other side of the main shipping channel.” The act to build a lighthouse was passed in July 23, 1715, which led to the opening of the Boston Lighthouse on September 14, 1716. 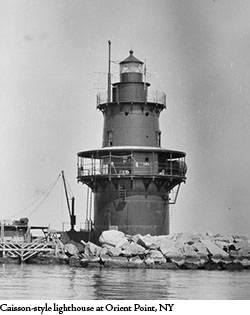 Even with those early mishaps, Boston realized that more lighthouses were in order. Nantucket became the next destination to provide aid for its “impressive whaling fleet,” and its first lighthouse “was lit by - what else? - whale oil.” Other states, including Rhode Island (Beavertail Lighthouse), Connecticut (New London Harbor Lighthouse), and South Carolina (Morris Island Lighthouse), followed suit. Over time, early colonial lighthouses served other purposes. Lighthouses at Gurnet Point and Thacher Island, for instance, “had significant strategic value” in the War of Independence, and “the safety of the Boston Lighthouse remained of paramount importance to the Redcoats.” George Washington was forced to burn down Boston’s great beacon, which had fallen into British hands, to gain a military advantage - and fought a series of battles “to disable if not destroy” New York’s Sandy Hook Lighthouse. Fortunately, most were used “as lookouts to alert the countryside to the arrival and movement of British ships,” and little else. When it ended, the brilliant beacons evolved yet again. New illumination processes, including kerosene, carbon lamps and electricity, created str ong amounts of light. While it didn’t always work perfectly - the Statue of Liberty’s “transitory days as a lighthouse” were unsuccessful - there was “progress in lighthouse design and construction.” Cost-effective cast-iron plates were used, as well as steel. 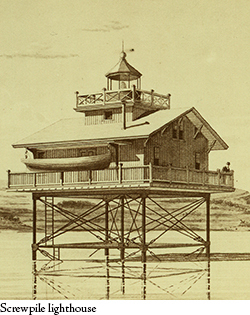 Meanwhile, screwpile lighthouses fell out of favor in some states, due to weather conditions and the like, and were occasionally replaced by caisson-style lighthouses. 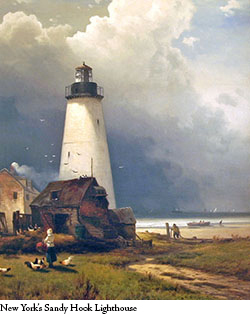 “For three centuries,” Dolin writes, “lighthouses have illuminated America’s shores...They truly are national treasures worthy of awe and admiration.” Even in this great age of technological advances, let’s hope that Americans always shine a light on this vitally important piece of the nation’s history.